A man from Jiwaka died inside a holding cell block at the Mutzing Police station at Markham, Morobe province when fire gutted the building this week. Local authorities and police are yet to release reports of the incident, but eyewitnesses say the building was allegedly set ablaze by possible arsonists. The Mutzing police station is the only police establishment in the district, and also looks after the travelling public on the Highlands highway. 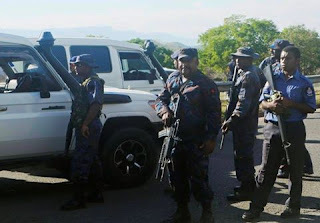 Local and provincial authorities are yet to give details of the incidents, while the Morobe rural police command is investigating. The Mutzing Police Station houses the Commander's office, CID and Traffic offices and a cell block, all of which were burnt to ash. The 40-year old male remandee unfortunately could not be saved as he was already choked to death by the thick smoke and heat from the fire. He was detained for two days before he met his fate. The Markham District Administration office responded minutes after the fire began but only managed to save a vehicle, because the fire could not be contained with minimal water supply.